During 1944, the scale of the fighting in the Pacific – and the length of the casualty lists – grew markedly. One of the costliest amphibious operations that year was the invasion of Peleliu, a small, but heavily-defended island in the southwestern Pacific. Nearly 10,000 Army troops and Marines were killed or wounded in the battle for Peleliu. Among the dead was Corporal Thomas Paul "Cotton" Jones. Jones served with the 1st Marine Division. On September 15, 1944, American forces assaulted Peleliu. Jones' unit came ashore on September 17. As he approached the beach carrying his machine gun, Thomas Jones was shot in the head and killed. 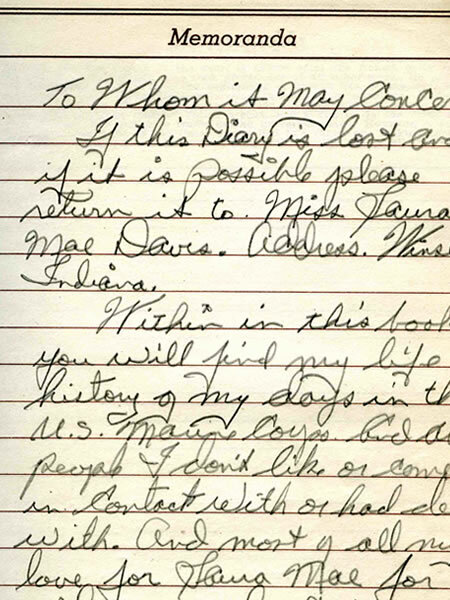 An entry in Cotton's wartime diary. Gift of Robert Hunt, 2001.166. 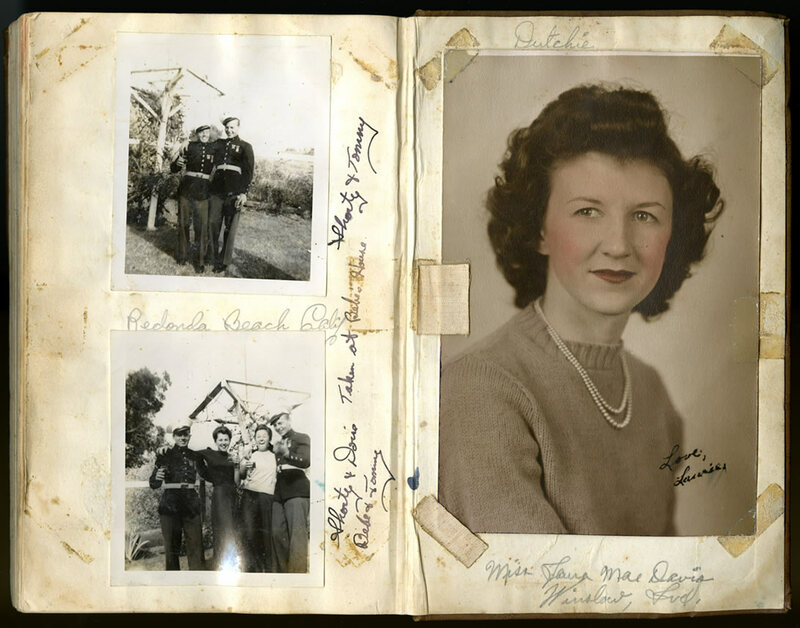 Photos pasted in the back cover of Cotton's wartime diary. Gift of Robert Hunt, 2001.166. 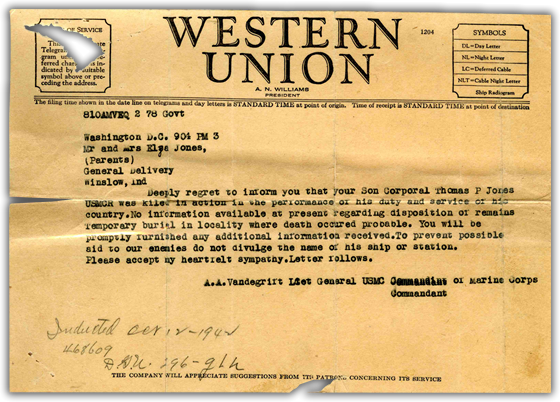 Telegram to the family of Corporal Thomas Paul "Cotton" Jones informing them of his death. Gift of Robert Hunt, 2001.116. 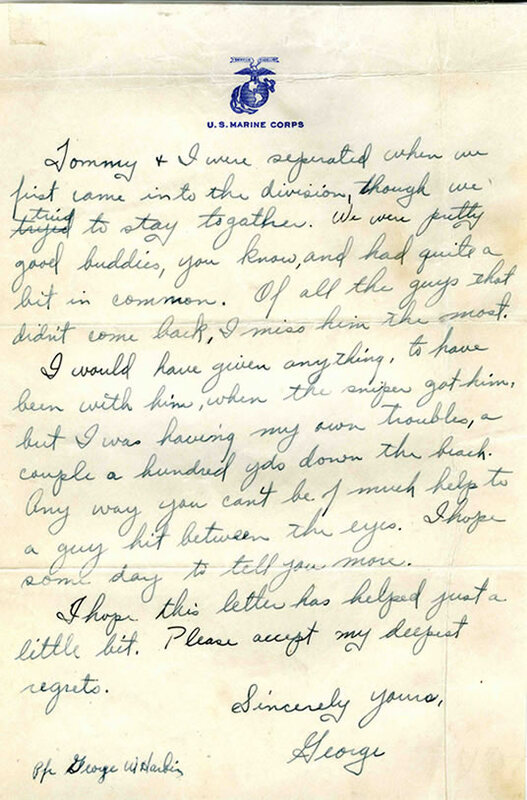 Five days later, unaware that her brother was dead, Jones' sister Mildred mailed a letter to him. 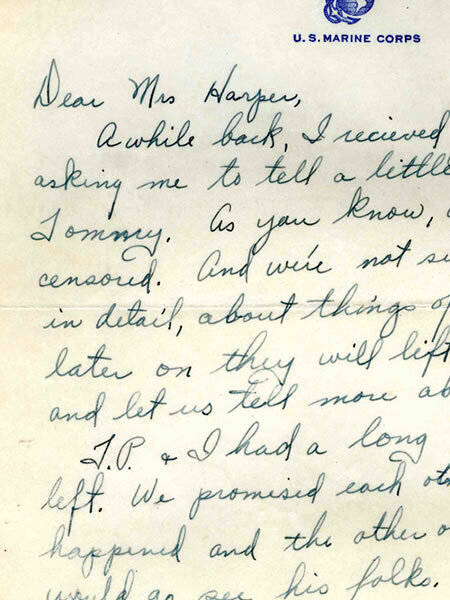 It was returned to her with the envelope stamped "undeliverable." 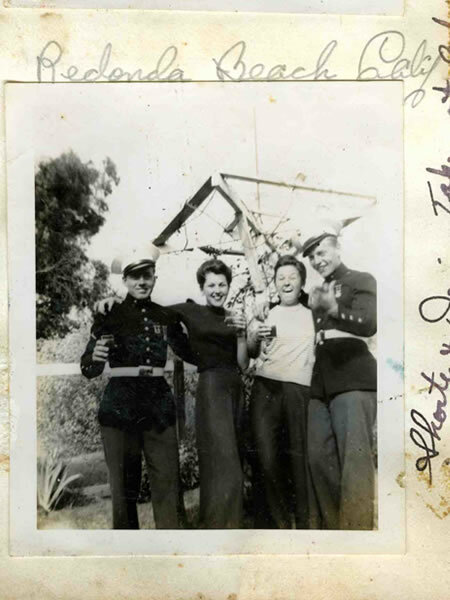 By then Jones' parents had learned of his death from the Marine Corps. Later, they were sent a Purple Heart, awarded to their son posthumously. 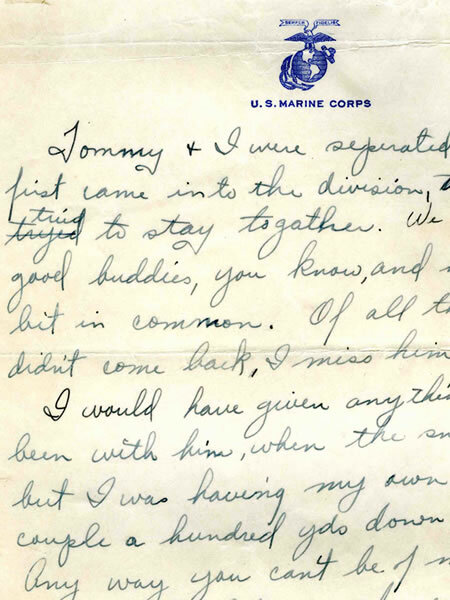 It was not uncommon for soldiers and sailors to write to the family of dead comrades, expressing their sorrow and offering words of comfort. 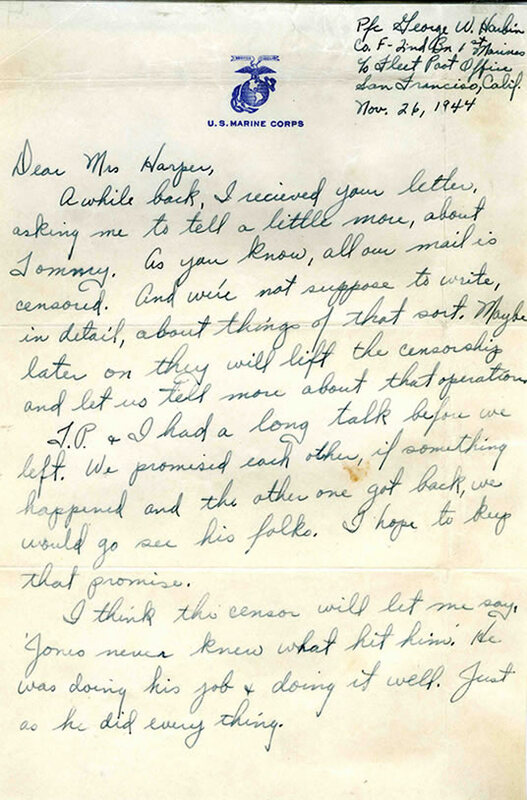 Private First Class George W. Harbin wrote to Jones' sister with the reassurance that, at least, Jones had died instantly with no pain. 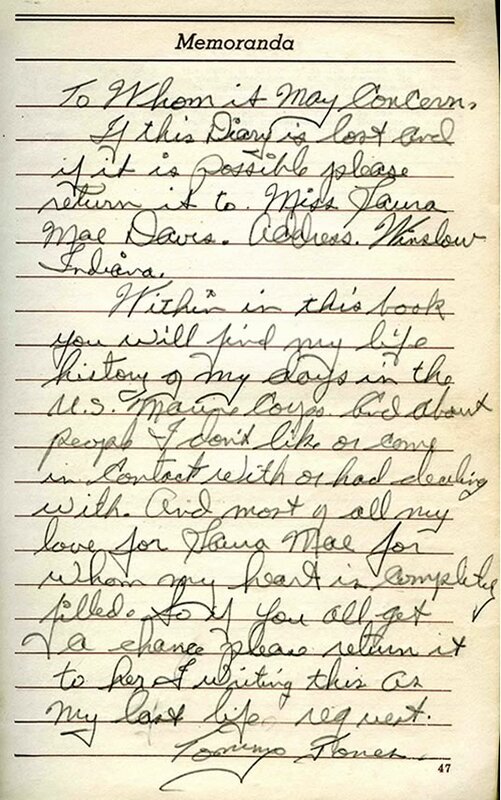 Condolence letter from Private First Class George W. Harbin, written to Jones' sister, Mildred. Gift of Robert Hunt, 2001.166. Thomas Jones was buried on Peleliu. A wooden cross marked his grave. After the war, his body was returned to the United States for burial in Winslow, Indiana. George Harbin attended the funeral.